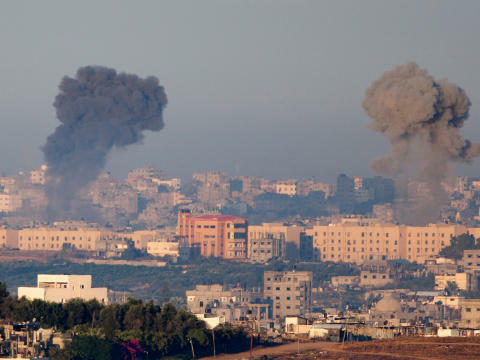 Israel and Hamas appear to be one step closer to a cease-fire agreement though the fighting continues to rage on from both sides. Israeli tanks and gunboats fired into Gaza while as many as 200 rockets were launched at Israel. In the meantime, officials from both sides work to propose a deal to put the fighting to a halt. The U.S. Secretary of State Hillary Clinton along with the U.N Chief and Egypt’s president has also got involved. Prime Minister Benyamin Netanyahu has publicly announced that the country hopes for a diplomatic solution to resolve the conflict though it will continue to take whatever steps are necessary to defend itself. Clinton has expressed her desire for an outcome that involves comprehensive peace talks and expressed her sorrows for the casualties on both sides but also stated that the U.S. remains committed to Israel’s security. According to a spokesperson, Clinton met with the Prime Minister to discuss efforts on de-escalating the situation. The Secretary of State also has plans to make stops in Cairo and Ramallah to meet with Egyptian officials. The fighting began on Nov 14th when Israel launched a retaliatory attack in response to months of rocket launches directed at its border. The attack began with an airstrike that killed a Hamas military chief. This was followed by a series of additional strikes that targeted militants and weapons storage sites. So far, 130 Palestinians have reportedly been killed by the strikes with dozens of civilians injured. The rockets launched by Hamas have so far killed five Israelis, which included a soldier and civilian. U.N. Chief Ban Ki-Moon criticized the rocket attacks by the Palestinians but also urged Israel to restrain itself from exercising too much military force. Israel is demanding that Hamas puts an end to the rocket fires from Gaza and to put an end to weapons smuggling that is taking place through underground tunnels between Egypt and Gaza. It is also calling for Hamas to pledge that it will not use Egypt’s Sinai region as a staging point for launching attacks at Israel.